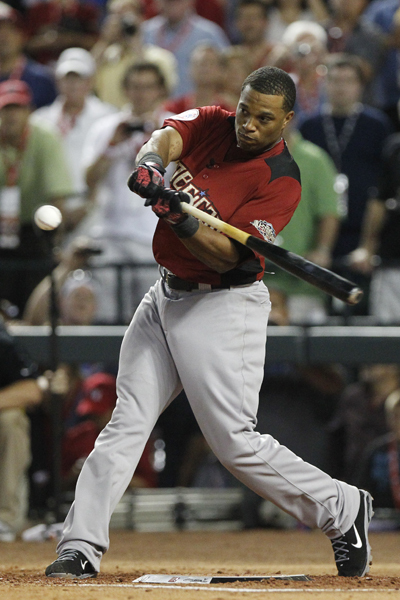 It was power on power, Yankees vs. Red Sox… The 2011 State Farm Home Run Derby featured a battle between two arch division rivals in Robinson Cano and Adrian Gonzalez. The duo put on quite the show in the 27th derby in All-Star history. Cano made a statement in the opening round by belting eight long balls. The Bronx Bomber then followed with 12 more homers in round two to advance to the finals. Meanwhile, Gonzalez smacked nine home runs of his own in the first round. The left-hander continued his hot hitting with 10 more shots in the middle round. The stage was then set for a classic New York-Boston final. It was the first time in Derby history that members of the Red Sox and Yankee squared off in the final round. It appeared as if Gonzalez had all but claimed his first derby trophy with an 11-homer performance in round three. However, Cano was far from finished. With his father, Jose, doing the pitching, the Yankees second baseman launched tape-measure shot after tape-measure shot en route to a 12-11 victory. It was a historic evening for Cano, whose 12 bombs set a new final round record. Having his dad out there made his victory even more special. His son blasted 32 total home runs, with an average distance of 433 feet. Just the fourth Yankee player to ever compete in the derby, he became the third Yankee to take home the trophy. With Cano’s win, second basemen have now won the exhibition on two occasions. The Cubs’ Ryne Sandberg did so in 1990. Despite falling in the final round to Cano, Gonzalez was thrilled to even make it to the finals. Both participants of the final round hailed from the American League team, which was captained and selected by Red Sox hitter David Ortiz. He also took part in this year’s derby after winning the 2010 crown. Ortiz hit nine homers of his own to become the all-time leader in derby home runs with 77. This year’s slugging event marked the first time in which captains chose their teammates. Gonzalez came away pretty impressed with the lineup Ortiz pieced together. Ortiz and the American League contestants were opposed by National League captain Prince Fielder. The Brewers’ first baseman hit quite a few majestic shots, as well. Fielder unleashed the longest blast of the night, which measured 474 feet. Cano wasn’t far behind as he hit a pair of 472-foot bombs.